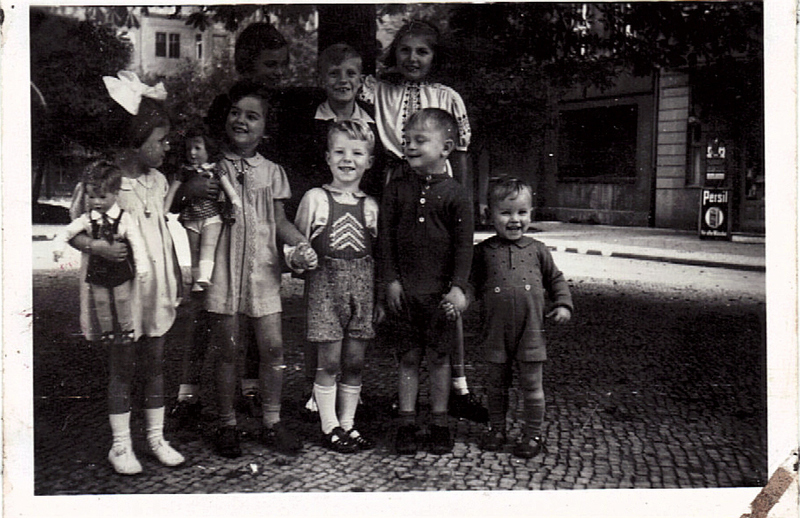 Before I was three we lived in Taunus Strasse, Berlin- Friedenau. Some time during 1937 we moved to Bozener Strasse in Berlin-Schöneberg. This is where Tante Ilse and Onkel Addi lived as well and also my friend Cordula and her parents. Later on we did get to know Family T. who lived in the house opposite our apartment building. During my early childhood Bozener Strasse was a very quiet street. There were no cars parked in the street. 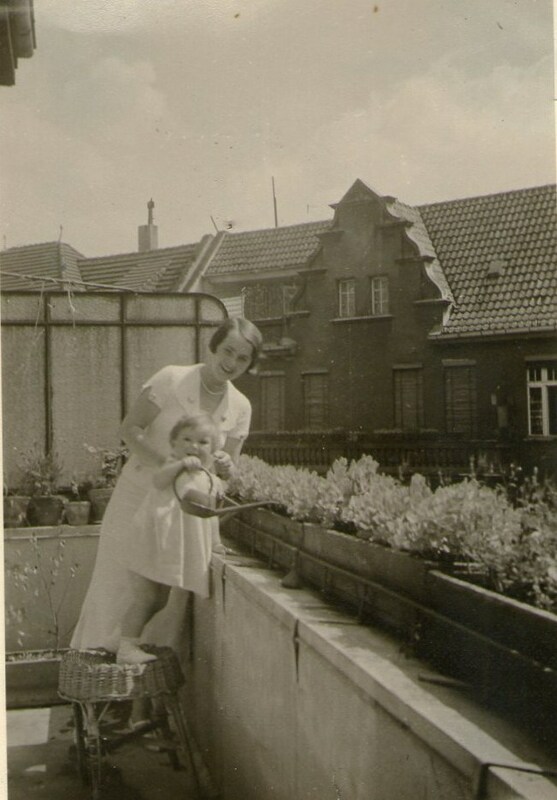 Tante Ilse had this narrow but very long balcony with a lot of plants to water. As a two year old I loved to help with watering some of the plants! Uta loves to water the plants. Mum is looking on. Here Mum still has this “Bubikopf” which I believe became fashionable already in the 1920s. The above picture is from my birthday in 1940. We stand under the huge chestnut tree. Cordula spent part of the war outside of Berlin. She is not in the 1940 picture. 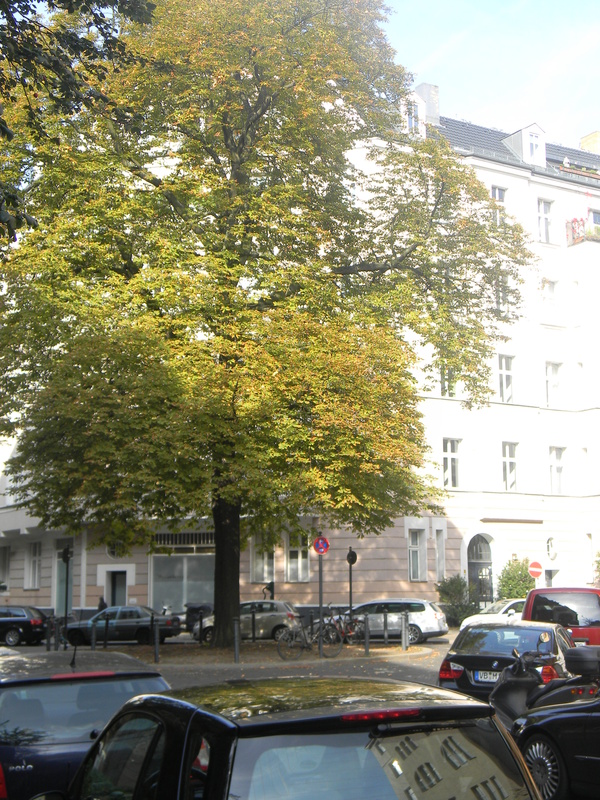 We took the following picture of Bozener Strasse during our Berlin visit in September 2012. It is still the same chestnut tree. But look at all the cars now! Our apartment was on the third floor, Tante Ilse lived two floors further up. Mum quite often went up with me to visit Tante Ilse. One of my early memories is that Tante Ilse and Mum were lying under the bright lights of some tanning lamps (Höhensonne). They used some oil on their skin which smelled beautiful and made their skin look shiny. Their skin usually had quite a bit of a tan. They wore some protective dark glasses. Sometimes they made me lie under the lamp for a little while. I liked it when some of this nice smelling oil was rubbed all over my body. I too had to wear these dark glasses. I liked to wear them for a little while. But I was required to lie totally still. Very soon I did get sick of it, not wanting to lie still any more under the hot tanning lamp. I was then always glad when I was allowed to get up again. I remember thinking that Auntie was a very beautiful looking woman with her very long curly hair. In the three way mirrors of her dressing table I remember watching how Auntie brushed her hair. It was very strong and long chestnut-coloured hair. Auntie usually brushed it slightly back so it stayed behind her ears. She often wore very long blue earrings. Oh, I loved the look of these blue earrings. They looked beautiful hanging down from Auntie’s ears! I think Mum did not wear any earrings, because her ears were covered by her hair. Mum’s brown hair was very fine and much shorter than Auntie’s. My hair was rather fine too. Mum always cut it quite short. I often wished that I could wear my hair longer but Mum would not let me grow it longer. Both Auntie Ilse and Mum wore identical three big rolls of hair horizontally on top of their heads. The front rolls covered the top of their foreheads, the other two rolls were rolled behind the front roll. They often wore identical clothes, for instance light pink angora wool tops with identical grey suits. 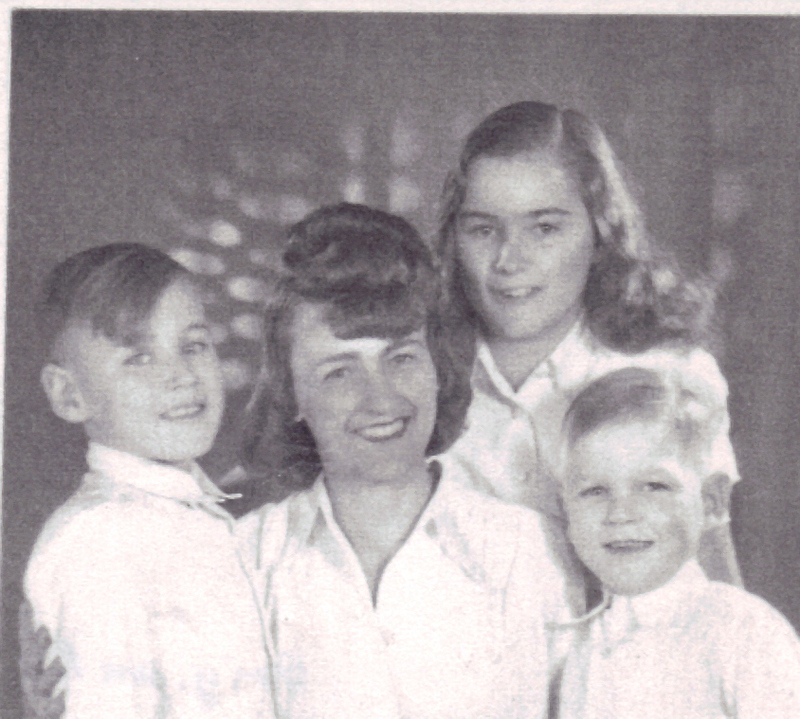 1948: Mum 37, Uta 14, Bodo 10 and Peter 7. Mum features her three big rolls of hair, I am already allowed to wear my hair long! Mum often called me ‘MAUSEL’ or ‘Mauselchen’, whereas Auntie liked to call me ‘HERZCHEN’ or ‘LIEBLING’. Dad sometimes said ‘HERZEL’ to me, but he usually called me by my name. Mausel is derived from Maus (mouse), Herzchen means ‘little heart’, Liebling means ‘darling’. Cordula’s mum once told me, that her name meant ‘heart’ in the Latin language, but not to tell anyone otherwise some children would make fun of the name. I did not want anyone to make fun of Cordula. So I promised myself to keep the meaning of the name to myself. My brother Bodo was born in June 1938. I think Cordula’s brother Tilwin was born a few months after that. Mum said that Tilwin was an extremely odd name. It turned out he grew up with very bright red hair. The children in the street teased him about his hair. As much as possible Cordula always stood up for her brother. I think for the most part Tilwin avoided playing with other children. The Lepsius apartment was on the same side as our apartment, just two floors further up. (Auntie Ilse’s apartment was on the other side of the fifth floor). I often went up to the Lepsius apartment all by myself to play with Cordula. They had a ‘roof-garden’ (Dachgarten) above their apartment. It was the size of a big room and had no roof above it. I remember the sun shining right into it. The floor was concrete and along the walls were garden-beds . Cordula was allowed to look after her own little garden-bed.. Once Cordula’s Mum let me have a portion of a little garden-bed too! Cordula’s Mum and Dad were always kind to me. They made me feel welcome and included. Cordula’s family had food that I had never seen before.. For snacks we children were often given some kind of brown flakes and raisins. Sometimes we were given dates or figs. I loved this food! My Mum thought it was strange to eat something like that. In Mum’s opinion this family was rather odd because they had lived in the Middle East for a while. Cordula’s father was an architect. My Mum called him ‘the Hunger-Architect’ (Hungerleider) since he seemed to get hardly any work in his profession. Mum must have seen their apartment once for I remember her remarking how sparsely furnished it was. Mum found their choice of furniture quite odd. There were a great number of shelves stacked full with books. These shelves went from floor to ceiling. Herr Lepsius sometimes showed us children books with colourful illustrations. He also told us stories. We loved one story in particular which had a funny ending. We demanded to be told that story again and again. Each time we laughed our heads off and Herr L laughed with us. The story was about a beggar who knocked at the door of an apartment. A beautiful maid opened the door. Some time later the beggar knocked at another door of an apartment in the neighbouring building. And the same beautiful maid opened the door! We found the astonishment of the beggar very funny! Herr L explained to us, that a wall had been broken through to connect the apartments on that floor. This was actually where the family of Herr L had lived, when he was a boy. Herr L was old and bald. He was about twenty years older than his wife. Quite a few years later Cordula and I went to the same high-school. We walked there together every morning. One morning I climbed up the stairs to Cordula’s apartment to find out why she had not come down yet to go to school with me. I rang the bell. Frau L opened the door. She was in tears. She did not let me come in but went with me to the top of the stairs. She said: “Our father just died; I haven’t even told Cordula yet.” She looked at me with despair in her face. I did not know what to say. She hugged me and then she disappeared in her apartment. The last paragraph is very interesting as you must have rang the door bell at a moment of great turmoil and grief for the L. family. That gave me an idea and I Googled her and I must say I’m very sorry to say I have learnt that your friend Cordula has passed away in the European summer of 2011. I will send you the notification by email. Ja, hoffentlich hört der Regen bei euch bald auf. In vielen Teilen Deutsclands sind ja zur Zeit Überschwemmungen. Wir sahen es in den Nachrichten. Wir hatten auch wieder etwas Regen. Dieser wurde bei uns gebraucht, denn es fing schon an etwas auszutrocknen. Na, dann lass mal deinen PC recht schön auf Schwung bringen! Dann macht das Schreiben wieder Spass. Viele liebe Grüsse von Uta. Lovely photos, Aunty. I guess back in those days the adverse effects of tanning salons was not known yet. You had gorgeous hair at 14 years in one of the pictures. Do you know where your friend Cordula is nowadays? I feel sorry that I had lost contact with Cordula over the years. The last time I had seen her was in 1986. I probably could have done more to keep in touch with her. All I know is that at the time her priorities were to give her two children the best possible start in life and to establish a business with her older and already retired husband. The death notice the computer found for Peter in a church bulletin from October 2011. This was definitely a death notice for Cordula. It showed the correct spelling of her first name and double surname. You at 14 is wow. And your mother looks so lovely. I can’t imagine handling that many kids! Funny you should think three kids is too many. Actually Tante Ilse thought so too. She thought two children would have been plenty, especially during times of war. The oil, yes Noeleen, I really loved the smell. I can still imagine all the beautiful smells in Auntie’s bedroom. I am still very sensitive to smell. Some smells I love, others I detest. Beautiful yet sad memories Auntyuta, I see by one of the other comments that your friend Cordula passed away in 2011, a beautiful friendship spanning many years. Emu, thanks very much for your comment. I have so many memories about Cordula going as far back as 1937 I believe. It’s kind of strange that there are big gaps when she wasn’t around because of the war. There were some beautiful years of friendship after the war. However she was in a different school year and had not the same friends that I had. Maybe Lieselotte who was in my class, was the only mutual friend we had. Then her Mum died and she moved away to live with her aunts. Later on she lived in the Middle East. She wrote me beautiful letters. She had a good job. She married late in life. Had two children, sent me lovely photos of her family. She moved with her husband back to Germany. I only saw her once again for an afternoon visit. This was in 1986, such a long time ago! There’s so much I don’t know. Maybe there’s a chance to find out where Tilwin, her brother, is. 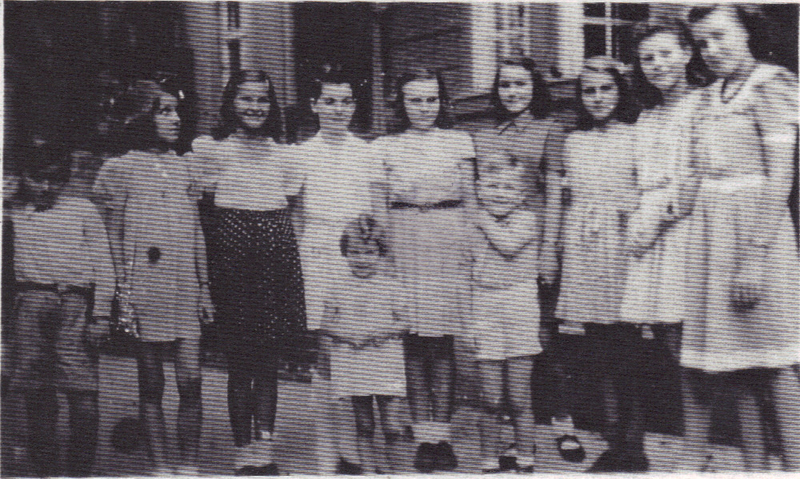 The last we heard from him, he lived with his wife and two children in Düsseldorf. But this goes back maybe fifty years. Such gaps in time. I can only say that I always thought that Cordula was a very special person. Maybe I’m imagining things, but I think she was filled with inner beauty. No, I’m not imagining this. This is how she was. I am sure she led a good life. You’re right, Emu, beautiful yet sad memories. mein Mitgefühl für die Freundin. I’m pleased, however, that you are sharing these memories with us. I feel like I was there. Gute Woche! Thanks, Devon, have a good week too. Hello, Amanda, thanks for visiting this page. I like your post ‘Something to Ponder About’. Very illuminating to hear real life stories from a turbulent time in history. Thank you.